Whilst we are enjoying making our homes beautiful, it's always nice to go on an adventure. The summer months are upon us (well, sort of) and we are seeing caravans appearing on the roads being towed by excited families ready for their summer jollies. Very recently, I was invited to contribute to an e-book with these families in mind. 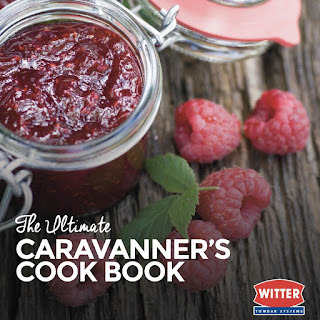 With hundreds of thousands of Brits every year taking their home away from home, 'The Ultimate Caravanner's Cook Book' is an essential guide to easy home cooking in the caravan. With the help of a group of UK bloggers, the recipes in the book are tried and tested from the family home and aim to inspire caravan enthusiasts everywhere to bring the best bits of home away with them. I contributed my recipe for quick and easy noodles with sausage and broccoli but I will be checking out the other recipes for sure. Perfect for the caravan and the kitchen, these super easy and creative recipes will ensure a happy crowd and are quick and easy to prepare, giving you more time to enjoy your summer adventures with friends and family. Are you a caravaner with a post to share about your touring antics? Do you have a go to recipe for summer get togethers? Do you have any tips for outdoor entertaining? Maybe a crowd pleasing recipe with minimal effort? Let's not forget desserts! What is great for the summer months? 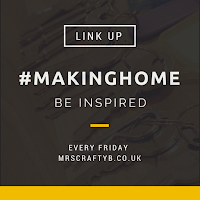 I would love to see your posts on all of the above and of course anything else related to home, crafts, garden and family adventures. Thank you for hosting, the cookbook is a great idea!